‘Fruit pretty large, somewhat pyramidal, much in the manner of the Saint Germain, but more rounded at the crown, and not so slender towards the stalk, about three inches and a half long, and two inches and three quarters in diameter. Eye small, very little sunk. Stalk three quarters of an inch long, straight, rather obliquely inserted, with a curb or embossment next the fruit. Skin very smooth, of a pale green, becoming a little yellow as it approaches maturity. Flesh extremely tender, and full of an excellent, saccharine, well-flavoured juice. Ripe in November, and will keep till Christmas.’ [George Lindley – Orchard Guide p.400/1831]. ‘The parent tree of this pear was raised from seed about 1780 by M. de Longueval, Avranches, Normandy. Some authorities say that the variety was first named Bonne de Longueval; others, that M. de Longueval immediately dedicated the pear to his wife and called it Bonne Louise de Longueval. Later still, the Pomological Congress adopted the name of Bonne Louise d' Avranches, by which it became more generally known, though in England, it rather unfortunately became widely disseminated as Louise Bonne de Jersey, having, presumably, found its way there through the Channel Islands. 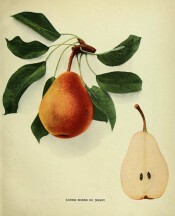 The variety was brought to the United States early in the nineteenth century, and in 1852 was entered in the recommended list of fruits of the American Pomological Society. In 1897, this Society shortened the name to Louise.’ [Pears of New York p.194]. Also figured in Le Jardin Fruitier du Muséum as ‘Louise Bonne d’Avranches’ [JFM vol.4/1861], in Saint-Hilaire [pl.56/1828] and in the Herefordshire Pomonia [HP pl.IX/1878]. ‘Colour greenish-brown and red; form pyramidal; size above medium; good quality. In use in February and March.’ [NHM vol.1 p80/1864]. Listed only in the 1857 catalogue in an Addendum as ‘Louise Boune’. This is amended in Macarthur’s hand to ‘Louise Bonne’ in a copy of the catalogue used by him for this purpose [Pear no.62/1857]. ‘62. Very handsome and good.’ [Diary B, MP A2951/1862]. Obtained from Veitch’s Nursery, probably the original Exeter premises.